Today's featured plant is Common Mullein, Verbascum thapsus. Common Mullein is also known as Great Mullein, Aaron's Rod, candlewick plant, flannel plant, flannel leaf, lungwort, feltwort, cowboy toilet paper, shepherd's staff, velvet dock, woolly mullein, torch plant, torches, miner's candle, big taper, blanket mullein, “Hig candlewick”, “Bullicks lungwort”, “Hare's-beard”, “Ice-leaf”.”Beggar's blanket”, “Moses' blanket”, “Poor Man's blanket”, “Our Lady's blanket” or “Old Man's Blanket”. 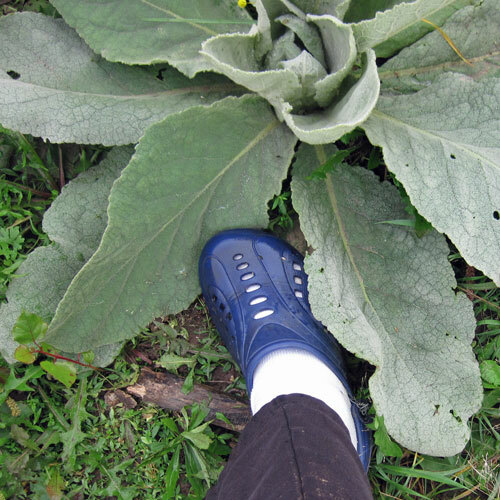 Common mullein is native to Europe, but it is now found on every continent except Antarctica. (As I said, it gets around…) The USDA Natural Resources Conservation Service provides a range map, but it's really found pretty much everywhere in the U.S..
Plant height is 2-6′ (60-180 cm) (the happy monsters in my garden last year were pushing seven feet). The leaves are large, oval and fuzzy. As you can see in the photo below, a large happy specimen in my garden has leaves larger than my shoe, which is a size twelve. Leaves are 12-15 inches long (or longer) and covered with velvety hairs. When the flower stalk emerges, leaves cling directly to the stalk – there are no side branches. Common mullein is a biennial, which means that it takes two years to reach maturity. The first year, plants form a rosette, as shown above. The second year, plants put up a single tall flower spike. Plants reproduce solely by seed. Here's a nice one from last year's garden. The wooden posts next to it were around 4 feet tall, so you can tell it was pretty big. The plant has many small yellow flowers. They begin opening at the lower end of the flower spike and work there way up to the tip of the spike, not unlike a gladiola. (If you're collecting flowers to use for herbcrafting you will need to pick over multiple days.) Flowers have five petals. (Wildflowers of Wisconsin) One plant can produce of 100,000 seeds, which can stay viable up to 100 years in the soil, so I don't generally let them seed out in the garden. I'm sure there are enough seeds hanging around from previous generations. Only a few animals use mullein for food. Certain species of thrips, stinkbugs, weevils, and leaf bugs will eat mullein leaves; but these are insects which were brought over from Europe. Short-horned Grasshoppers, such as the Differential Grasshopper, will also eat leaves. American Goldfinches, Indigo Buntings, and a few other birds eat mullein seeds. 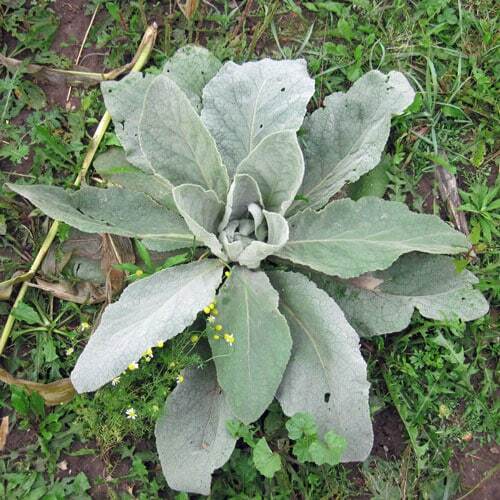 Common Mullein provide shelter for insects in the winter. Since rosettes survive through the cold weather, leaves provide warm and protection for ladybugs, plant bugs, and black bugs, among others. Hummingbirds sometimes use the soft leaves to line their nests. Many insects come to mullein flowers for nectar. Bumble bees, honey bees, and hover flies help pollinate these plants. Several species of fungi become parasites of Common Mullein, including Powdery Mildew. Great Mullein has been used as an alternative medicine for centuries, and in many countries throughout the world, the value of Great Mullein as a proven medicinal herb is now backed by scientific evidence. Some valuable constituents contained in Mullein are Coumarin and Hesperidin, they exhibit many healing abilities. Research indicates some of the uses as analgesic, antihistaminic, anti-inflammatory, anticancer, antioxidant, antiviral, bacteristat, cardio-depressant, estrogenic, fungicide, hypnotic, sedative and pesticide are valid. An infusion is taken internally in the treatment of a wide range of chest complaints and also to treat diarrhea and bleeding of the lungs and bowels. The leaves, root, and the flowers are anodyne, anti-inflammatory, antiseptic, antispasmodic, astringent, demulcent, diuretic, emollient, expectorant, nervine, and vulnerary. Mullein oil is a very medicinal and valuable destroyer of disease germs. An infusion of the flowers in olive oil is used as earache drops, or as a local application in the treatment of piles and other mucous membrane inflammations. This infusion is a strong antibacterial. The oil being used to treat gum and mouth ulcers is very effective. A decoction of the roots is used to alleviate toothache and also relieve cramps and convulsions. It is also used in alternative medicine for the treatment of migraine headaches accompanied with oppression of the ear. The whole plant possess slightly sedative and narcotic properties. The seeds are considered toxic. They have been historically used as a narcotic and also contain saponins. The dried leaves are sometimes smoked to relieve the irritation of the respiratory mucus membranes, and the hacking cough of consumption. They can be employed with equal benefit when made into cigarettes, for asthma and spasmodic coughs in general. Externally, a medicinal poultice of the leaves is applied to sunburn, ulcers, tumors and piles. I have used a tea made from the dried leaves to calm a cough. We haven't had any ear aches or other ear problems since I started harvesting mullein, so I can't vouch for other uses. You can view how to dry the flowers and leaves in the post Wildcrafting 101. Mullein also contains coumarin and rotenone – a naturally occurring pesticide. For more ideas on how to use mullein medicinally, visit kingdomPlantea.net. I hope you've enjoyed this post. If so, please pass it along. My sister-in-law is starting to work with herbs so I sent her your link. I'm hoping she will start blogging and link up with you. It's a great opportunity to learn. Hi, I’ve joined up with Wild Craft Wednesday for Jan. 18 with a blog post on making flax seed jelly for cough relief and sore throats. I have a fiber farm and we grow linen (tall flax). We also have a natural dye garden and I use the mullein that grows in our pastures for dye. You don’t need to laboriously harvest the flowers over many days in order to dye with them. Mullein leaves also contain the dye chromophores. But you do need to extract the dye with a alkaline water, rather than just using tap water. A tbsp of baking soda or washing soda does the trick. You also want to use the plant during or after flowering as the plant needs some sunshine and an extended growing season to develop the colour in the leaves. I tried dyeing with the first year rosettes that I weeded out of my garden and only got khaki. So go for the second year leaves. When you tear the leaves to make a dye bath though, wear a dust mask and gloves. The fine hairs on the leaves are irritating to your skin and to your lungs. Since mullein has insecticidal properties, cloth dyed with mullein may inhibit mosquitoes and moths. I haven’t tested this aspect fully though. Chris – thanks so much for your input on this. I haven’t worked with dying yet (not much of a fabric arts person), so I really appreciate hearing from someone with dying experience. 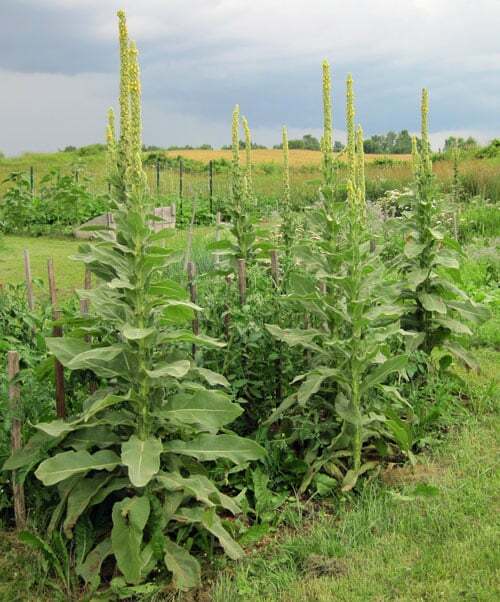 Laurie, thanks for this post–we have tons of mullein on our property. Do you know if it’s safe for chickens to eat? I’ve heard it is toxic to them. I would love to find a use for all the seed heads in the fall and winter. If chickens are free range they generally know what to leave like mallow which is poisonous. I wouldn’t worry unless you pick it for them and haven’t seen them eat it. Just watch and see, they generally know. Looking forward to reading info, looks interesting! I was told that using the “tea” from this plant in a humidifier or teapot can ease asthma symptoms when inhaled. I have not tried this. Have you heard of this use? I haven’t heard of this use specifically, but it makes sense given the properties of the plant and similar uses. As a child 45 years ago, my great-grandmother would send us to pick Mullein along the railroad tracks (one can always find it growing there in Ohio.) She’d strip off the top leaves and dry them to make Mullein tea for controlling blood pressure and increasing circulation. Ah! The good old “cabbage weed” as I call it! Thrives in our yard in the Australian Capital Territory! Its great to find your website. I am a novice at this, but husband has an earache. Some of these remedies I would have tried, but you have provided lots of useful and helpful choices. I really want to learn how to grow a few herbs for health purposes and to have natural beauty around and also for food. Will check you out again and the other sites you recommended. I have several little ones around and would prefer natural remedies to sore bought and pharmaceuticals. Hi Saundra! Welcome to the site. I’ll be doing more with fresh herbs and wildcrafting again soon that it has finally warmed up outside. I’m glad you find the site useful. You may also enjoy the Home Remedies series of posts. I have this, having gathered seed from a plant by the road. I have read that pioneers used the large soft leaves as diapers. Weird because it would not absorb. I’m not sure how this would work out. …i love the pic’s..where do you live? Northeast Wisconsin, with gently rolling hills and more cows than people. I do enjoy your Weekly Weeder posts and since I have a BIG one growing out on The North Fourth, I appreciate learning what it’s useful for. A very good weed to have around, I’d say, especially since I’m always looking for things the Goldfinches love. Thanks so much for your well-written, informative posts. I’m glad you enjoy them. I love watching the finches bob on flower heads, too. I was wondering if there is a specific time to harvest the mullein leaves? I have loads of them in my pasture and would like to make the tea. Also, is the tea safe for everyday consumption? Mullein leaves are best harvested in the summer of the second year as the plant is growing its stalk. Bundle and hang the leaves upside down to dry. Harvest the buds and flowers when in bloom (Usually between July and September) and use them fresh or dried. Roots can be gathered before the stalk grows, sliced and dried. Mullein is basically free of toxicity (as long as it is gathered from a clean location) and can be used in large doses. To make a tea, use one ounce of the herb per pint of water. Be sure to strain the tea well as the hairs can be irritating. Drink up to three cups per day. As a tincture, take 20-60 drops up to three times a day. Fascinating article. Thank you for writing. We came across this plant while walking in Cherry Creek Reservoir, Colorado and were wondering what the plant was called. V. helpful article! Very interesting article and will need to consider harvesting for different uses. We are building in the foothills west of Ft Collins, CO. We have tons of them where we disturbed the ground for building and along the roads. I looked this up because I witnessed a few things. One I rubbed the leaf on the back of my hand and did notice a little irritation. Very mild however. Then the finches, grosbeaks, and woodpeckers are loving them. Yesterday we had a herd of cows come up the mountain (that’s a story in itself) but they were plowing through the draws lopping off spike after spike eating them like it was the best feed they have ever found. That is what prompted me to find out more! I sprained my wrist as a kid, my grandfather told my dad to get the leaves and put them in water, get them nice and hot, don’t melt them, and wrap around my wrist when they have cooled down enough for me to tolerate the warmth. Swelling went down over night and no pain the next day.